The members on the press tour remained aboard the bus while moving around the plant. After about three hours there, the dosimeter I was carrying recorded 75 microsieverts of accumulated radiation exposure, about 1.25 times higher than the dose received during a chest X-ray. When I returned to J-Village, I felt ill from the heat and fatigue. FUKUSHIMA: The most striking feature at this crippled plant was not the blasted-out reactor buildings, or makeshift tsunami walls, but the chaotic mess. The ground around the four hulking reactor buildings was littered with mangled trucks, twisted metal beams and broken building frames, left mostly as they were after Japan’s March 11 earthquake and tsunami. In a country as compulsively tidy as Japan, the fact the scene has changed so little was as telling a sign as any of the tasks workers have faced while struggling to regain control of the plant’s three badly damaged nuclear reactors. The media tour of the site, the first since disaster struck on March 11, appeared to be Tokyo Electric Power Co’s way of declaring its confidence that it is close to stabilising the plant. That message was driven home by the minister supervising the government’s response to the nuclear accident, Goshi Hosono, who visited the plant at the same time as the journalists. Speaking to hundreds of workers, Mr Hosono praised their hard work in difficult and dangerous conditions. But the hopeful talk skims over more troubling truths. Two weeks ago, TEPCO announced it found signs one of the reactor cores may have had a burst of fission, a frightening sign the company might not be as close to a stable shutdown as it said. While no one died in the nuclear accident, the environmental and human costs were clear during the 20 kilometre drive to the plant through the evacuation zone. The dosimeters of the journalists on the bus buzzed constantly, recording levels that ticked up with each passing kilometre: 0.7 microsieverts in Naraha, at the edge of the evacuation zone; 1.5 at Tomioka, where the welcome centre for Fukushima Daiichi told Japanese visitors that nuclear power was safe. Saturday’s level was 13 times the recommended maximum annual dosage for civilians. 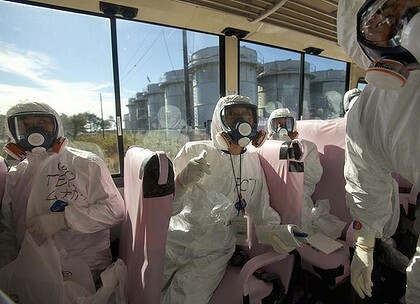 At the plant, journalists, outfitted in full contamination suits, were kept aboard the bus in recognition of the much higher radiation levels there. One worker, Hiroyuki Shida, 57, said ”radiation levels aren’t so high outside the buildings. But they are still high within the reactor buildings”.